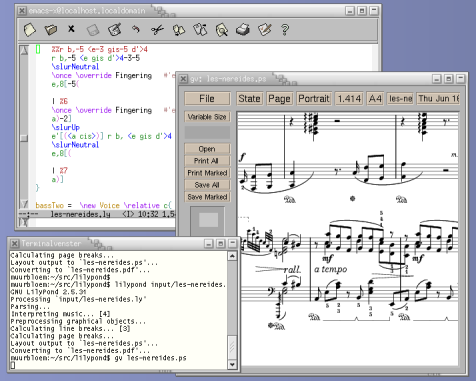 LilyPond is a compiled system: it is run on a text file describing the music. The resulting output is viewed on-screen or printed. In some ways, LilyPond is more similar to a programming language than graphical score editing software. 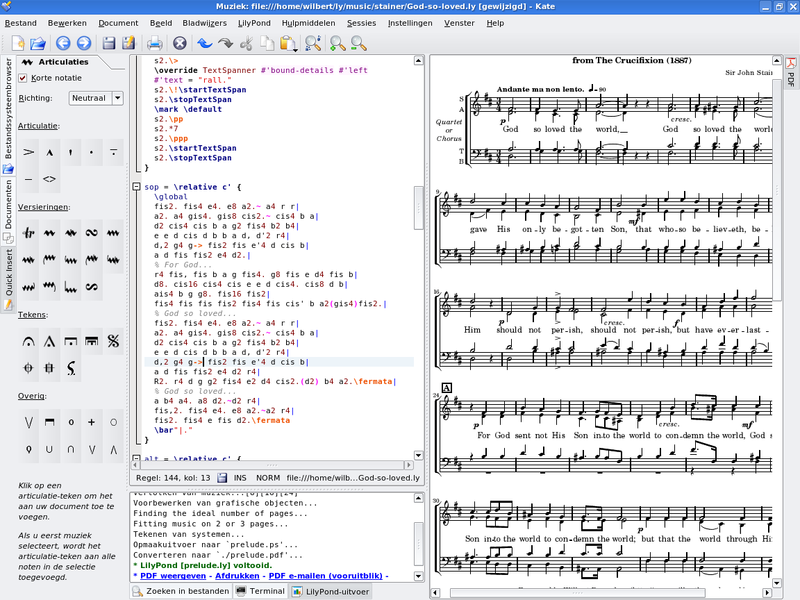 You do not write music by dragging notes from a graphical toolbar and placing them on a dynamically refreshing score; you write music by typing text. This text is interpreted (or “compiled”) by LilyPond, which produces beautifully engraved sheet music. People accustomed to graphical user interfaces might need to learn a new way of working, but the results are definitely worth it! Note: We present a quick overview of our text input – it’s not as complicated as it sounds! Don’t worry about understanding every detail in these examples; our beginner documentation covers everything at a much more gradual pace. Notes are encoded with letters and numbers. Special commands are entered with backslashes. Alterations are made with different names: add -is for sharp, and -es for flat (these are Dutch note names, other languages are available). LilyPond figures out where to put accidentals. 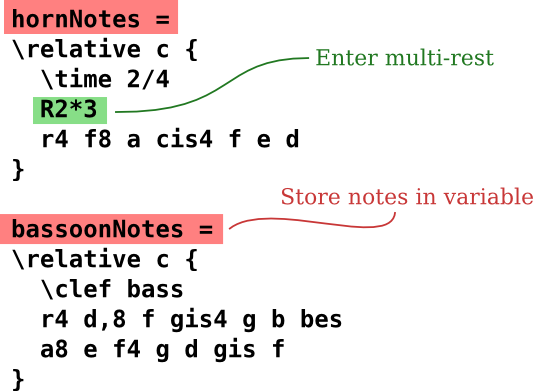 The input file contains the notes of piece of music. Score and parts can be made from a single input file, so that changing a note always affects the score and parts. 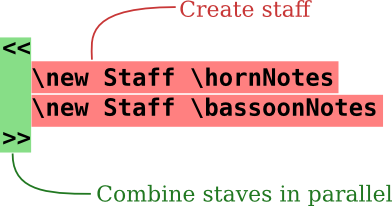 To be able to include the same music in multiple places, the music is assigned to a “variable” (a name). We realize that many users find this way of entering music a bit odd. For this reason, we have written extensive documentation to help new users, beginning with Learning. The Learning Manual is the best place to start, as many questions are answered before they come up! Occasionally new users are unnecessarily confused by some aspects of LilyPond’s behaviour. Please read this manual before doubting whether LilyPond is working correctly. More in-depth information is available in Manuals. Ben Lemon, a LilyPond user, has created a range of video tutorials on his blog and which are aimed at new users. 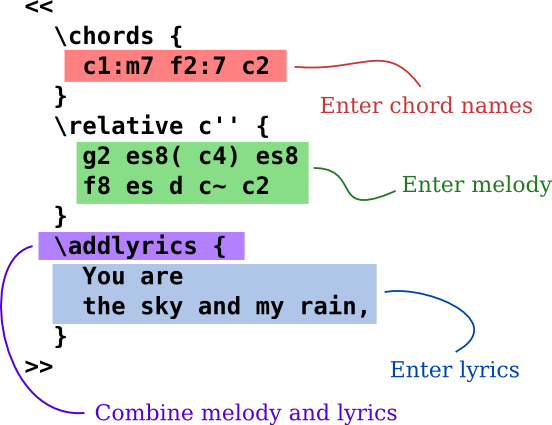 LilyPond is primarily concerned with producing top-quality engraved sheet music; creating a Graphical User Interface (GUI) would distract us from this goal. However, there are other projects aimed at making it easier to create LilyPond input files. 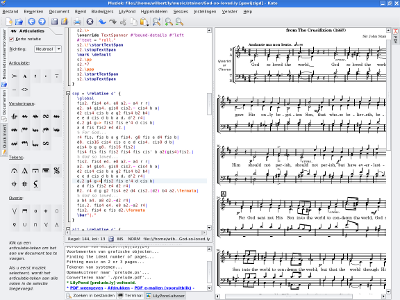 Some editing environments include syntax highlighting, automatic command completion, and pre-made templates. Other programs actually provide a GUI which allows direct manipulation of a graphical score. For more information, see Easier editing. You are now ready to Download LilyPond. Still not convinced? Read about Easier editing.